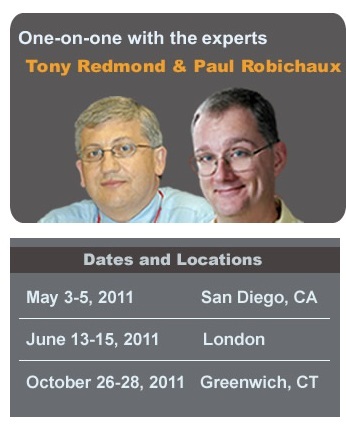 Paul Robichaux and I will be running three more Exchange 2010 Maestro seminars in San Diego, London (UK), and Greenwich, CT in May, June, and October. The site that we use for enrollment isn’t quite ready yet, but you can register to receive more information when all of the details are settled (for example, the cost for the UK event will obvious be in pounds sterling rather than dollars!). With instructors like this, who needs entertainment (or clowns)? I’m really happy that we’ve been able to sort out the essential details that are necessary to organize these events. It’s great to be able to do an event in London as many folks in Europe have contacted us to ask us to run an event outside the US. Why London? Well, it’s well connected in terms of air travel and our partner, Penton Communications, has good logistical support there, so we’re confident that we can run a high-quality event. Some might ask why we’re going to Greenwich. The answer is simple – it’s too expensive to run a relatively small training event in New York City because the hotels ask for huge guarantees for rooms and food. In other words, you have no problems whatsoever booking an event that will have four hundred attendees as you can cope with the hotel demands. But if you try to make a deal for an event that has less than a hundred, the deposit becomes a real concern. In any case, we elected to go a little outside town to keep costs down. We hope to have the redoubtable Brian Desmond back with us as lab master. Labs posed an interesting challenge for us in our last two events. Paul and I lecture for about 19 hours over the three days, which is a lot of material for attendees to sit through. Labs provide a break from lectures and serve to reinforce the points contained in the lectures, so they’re a good thing and we like having them incorporated in the schedule. We run all the labs on virtual machines and provide the VMs on a hard drive that attendees connect to their own laptop. This isn’t intended to be an ideal environment for labs as running VMs off a 5400 rpm hard drive is slow (yes, we could provide SSDs but that would add several hundred dollars to the cost). Exchange 2010 needs a few computers before it is fully operational (Active Directory controller, mailbox server, HT/CAS) and it takes time for the VMs to load and have everything ready before any useful work can be done. If come along to the event and don’t bring a heavy-duty 64-bit laptop, you’ll have lots of time to drink coffee while the VMs load. However, the real purpose of the labs is not to sit in class having a “click along with the instructor” experience. Instead, the labs are designed to be an environment that attendees can take away and reuse when they get back to work. Hopefully, the VMs will be moved onto more reasonable hardware so that performance improves, and afterwards they can be used as a test environment to help prepare the company to migrate to Exchange 2010. In short, if you come along, don’t expect to spend lots of time waiting to be told what to do in the labs. Be prepared to get acquainted with the labs and be ready to reuse them to do some real work when you get back to home base. This entry was posted in Exchange, Exchange 2010, Training and tagged Exchange 2010 SP1, Exchange 2010 Training, Maestro, Training. Bookmark the permalink.